METS: Metabolic Equivalents- Oxygen uptake required for a given task expressed as multiples of resting oxygen uptake. RR: Respiration rate- Number of breaths per minute. VT: Tidal volume- The volume of air actually breathed per breath in ml. VE: Minute ventilation- The volume of air taken into or exhaled from the body in one minute. This is conventionally expressed at body temperature, saturated with water at atmospheric pressure (BTPS). V02: The amount of oxygen extracted from the inspired gas in a given period of time, expressed in millilitres or liters per minute, standard pressure and temperature, dry (STPD). This can differ from oxygen consumption under conditions in which oxygen is flowing into or being utilized from the body's stores. In the steady-state, oxygen uptake equals oxygen consumption. V02 relative: V02 expressed in ml/kg/min. VC02: The amount of carbon dioxide (C02) exhaled from the body into the atmosphere per unit time, expressed in millilitres or liters per minute, STPD. This differs from C02 production rate under conditions in which additional C02 may be evolved from the body stores or C02 is added to the body stores. In steady state, C02 output equals C02 production rate. In rare circumstances, appreciable quantities of C02 can be eliminated from the body as bicarbonate via the gastro-intestinal tract or by haemodialysis. RQ: The respiratory quotient is the rate of carbon dioxide production to oxygen consumption. This ratio reflects the metabolic exchange of gasses in the bodies' tissue and is dictated by substrate utilization. VE/V02: Respiration equivalent for oxygen is the actual ventilation against absolute oxygen uptake. This parameter indicates how much air (l) must be inhaled to obtain a liter of oxygen. VE/VC02: Respiration equivalent for carbon dioxide is the actual ventilation against absolute carbon dioxide exhaled. This parameter indicates how much air (l) must be exhaled for one liter of carbon dioxide to be expelled. The smaller this parameter the better the carbon dioxide exchange efficiency. et02: End tidal expired oxygen partial pressure (mmHg) is the partial oxygen pressure (P02) determined in the respired gas at the end of an exhalation. This is typically the lowest Po2 determined during the alveolar portion of the exhalation. etC02: End tidal expired carbon dioxide partial pressure (mmHg) is the partial carbon dioxide pressure (PC02) of the respired gas determined at the end of an exhalation. This is commonly the highest PC02 measured during the alveolar phase of exhalation. Incremental capillary blood lactate measurements were taken during the treadmill test by using an Accurex BM lactate meter (Roche diagnostics). This required a puncture of the fingertip to obtain a peripheral blood sample. These samples were taken at the end of each two-minute stage during the treadmill test. 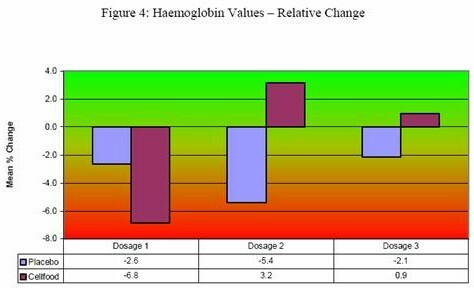 The values were reported in mmol/l. Incremental haemoglobin oxygen saturation levels were taken using a Datex-Ohmeda TuffSat hand-held pulse oximeter. The measurements were taken using a finger probe (ClipTip -sensor). 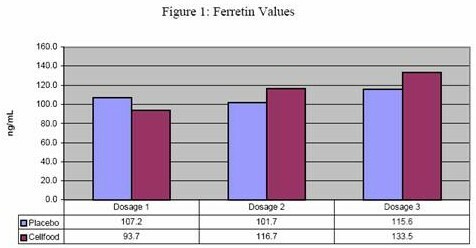 These measurements were taken at the end of each two-minute stage directly after the blood samples were taken, expressed as a percentage. The original Borg scale (6-20) was used to determine the perceived rate of exertion (RPE) for each subject (Borg, 1973). They were asked to indicate their perceived level of exertion on the scale at the end of each two-minute stage during the treadmill run. Heart rates were recorded using a Polar Accurex Plus heart rate monitor. Heart rates were recorded continuously during the entire test. All the above-mentioned variables affect the performance of an endurance athlete, no matter what their conditioning level or potential for the sport. Next we will have a look at how CELLFOOD® influenced these variables during our experiment. Iron (ferretin) has two very important exercise related functions. Firstly, about 80% of the iron in the body is in functionally active compounds combined with haemoglobin in red blood cells. This iron-protein compound increases the oxygen carrying capacity of the blood about 65 times. Secondly, iron (about 5%) is a structural component of myoglobin, which aids in the transport and storage of oxygen within muscle cells (McCardle, Katch and Katch, 1991) About 20% of the iron in the body is found in the liver, spleen and bone marrow in the forms of hemosiderin and ferretin. 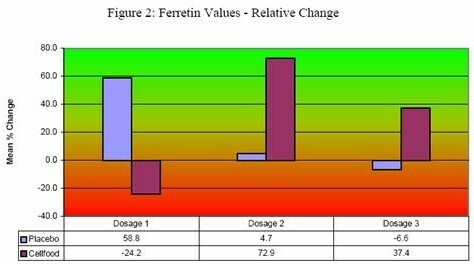 Since ferretin is present in the plasma it is an excellent indicator of the iron stores of the body (Meyer and Meij, 1996) Normal iron levels are crucial in preventing conditions such as iron deficiency anaemia (McArdle et al., 1991). Iron deficiency anaemia is characterized by sluggishness, loss of appetite and a reduced capacity for sustaining even mild exercise (McArdle et al., 1991). Keeping the above-mentioned in mind one can see why it would be beneficial if either one of the products would be effective in increasing the iron stores in the body. Haemoglobin is essential for the transport of both oxygen and carbon dioxide. Haemoglobin also serves the important function of acting as an acid base balance buffer (Meyer and Meij, 1996). Oxygen is not very soluble in fluid substances, only about 0.3ml gaseous oxygen dissolves in each 100ml of plasma. Although this is a very small amount it serves an important physiological purpose in establishing the P02 of the blood and the tissues. This pressure plays a role in the regulation of breathing and also determines the loading and release of oxygen from haemoglobin in the lungs and tissues respectively (McCardle, Katch and Katch, 1991). This means that the majority of oxygen is carried through the body in chemical combinations. This takes place with the help of haemoglobin. Haemoglobin contributes to about 34% of the volume of a red blood cell. 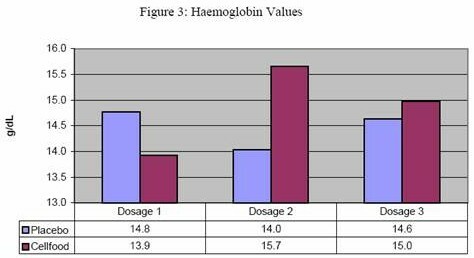 Haemoglobin increases the blood's oxygen carrying capacity with about 65 to 70 times compared to that of the dissolved oxygen in the plasma. Thus for each liter of blood about 197ml of oxygen are carried through the body in chemical combination with haemoglobin (McCardle, Katch and Katch, 1991) Men have approximately 15-16 g of haemoglobin in each 100ml of blood. The blood's oxygen carrying capacity changes only slightly with normal variations in haemoglobin values, while a significant decrease in iron content of the red blood cells will lead to a decrease in the blood's oxygen carrying capacity and corresponding reduced capacity for sustaining even mild aerobic exercise (McCardle, Katch and Katch, 1991). It is possible to determine the amount of red blood cells per volume unit of blood. The average count for adult males vary from 4.6 to 6.2 x 10 12 /l blood and adult woman from 4.2 to 5.4 x 1012 /l. The red cell count is higher in newborn babies as well as people who live at high levels above sea level. The values could also be higher or lower during certain illnesses (Meyer and Meij, 1996). Three of the main functions of red blood cells include the following: firstly they are responsible for the transport of oxygen from the lungs to the tissue and transport of carbon dioxide from the tissue to the lungs. Secondly, red blood cells help to maintain pH homeostasis within the body. Thirdly, red blood cells contribute just as much to the viscosity of the blood as plasma proteins. Hematocrit refers to the contribution of cells to a certain volume of blood. White blood cells contribute less than 0.08% to the hematocrit. The contribution of cells is higher in newly born infants and people who live at high levels above sea level as well as people that are dehydrated and people with high red cell counts. The values are lower in people who suffer from anaemia (Meyer and Meij, 1996). to transport oxygen through their bodies to their working muscles."